Will Steelers Target Free Agent Justin Hunter for a Return to Pittsburgh? Will Steelers Target Free Agent Justin Hunter for Return to Pittsburgh? While big-dollar, high profile free agent signings dominate NFL free agency, lower paid free agents typically make up most of the moment. The Steelers have been particularly active in singing these lower-rung free agents either at or very close to the veteran minimum in recent years. Some, signings such as Darrius Heyward-Bey or Brice McCain, have delivered solid value. Others, such as Guy Whimper? Not so much. 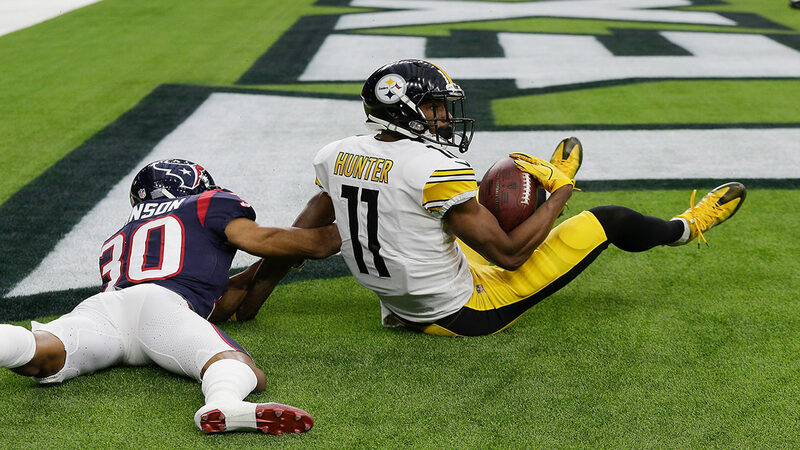 Then there are players like Justin Hunter, the wide receiver the Steelers inked one year ago who, although he didn’t do much in his first season in Pittsburgh, could return to the Steelers if the tea leaves are correct. With Antonio Brown resigned and Martavis Bryant headed back from suspension, wide receiver wasn’t perceived as a need for the Steelers heading into free agency a year ago. Yet the Steelers quickly inked a veteran minimum deal with Justin Hunter. Although Hunter made the Steelers roster, he only saw action in Steelers road win over the Ravens, the home loss to the Jaguars, the Lions and Packers wins, the home win against the Ravens, the Christmas win against the Texans and the season finale against the Browns. Trough it all, Hunter got targeted 10 times, for four four catches, including one touchdown. In two games, neither Ben Roethlisberger nor Landry Jones targeted Hunter. He scored a touchdown against Houston, and his longest pass reception of the season was for 7 yards. Still, if Steel City Insider’s Jim Wexell is correct, Justin Hunter improved during the course of the year and was catching incredibly well in practice by season’s end. No one is going to throw money at Justin Hunter, so the Steelers could easily bring him back in what would essentially be a no-risk high, reward move. No only did Justin Hunter only have 4 catches in all of 2017, he couldn’t get any targets in the Steelers season-finale against Cleveland. Assuming Vance McDonald and Jesse James maintain their level of performance in the Steelers passing game in 2018, the 4 wide receiver slot in the Steelers offense isn’t critically important – assuming no one gets injured. Practice makes perfect. You win championships by doing things ordinary things extraordinarily. Football games are won on Sunday through preparations made Wednesday through Friday. Each one of those statements is true. Yet excellence on the practice field doesn’t always translate into excellence on Sunday afternoons. Going into the Steelers 2015 playoff game against the Broncos, the Steelers PR staff did its best to puff Sammie Coates progress. And while Sammie Coates did play well in the playoff game, the rest of his Steelers resume is defined by the plays he didn’t make. After the 2013 and 2015 seasons, respectively, Dale Lolley and Jim Wexell talked up the prospects of Justin Brown and Xavier Grimble based on what these two gentleman had shown in their practice squad apprenticeships. Brown made the team in and got playing time early in the year, but the Steelers cut Justin Brown in December. Xavier Grimble has solid, serviceable 3rd tight end for the Steelers. At the end of the day, there’s no real risk in the Steelers resigning Justin Hunter to a veteran minimum contract, and if the press reports of his performance in practice are a guide, Pittsburgh will do just that. Has Steelers free agency left you scrambling? Click here for our Steelers 2018 Free Agent tracker or click here for all Steelers 2018 free agency focus articles. This entry was posted in Steelers 2018 Free Agent Focus, Steelers 2018 Off Season and tagged Antonio Brown, Ben Roethlisberger, Brice McCain, Darrius Heyward-Bey, Eli Rogers, Jesse James, JuJu Smith-Schuster, Justin Hunter, Martavis Bryant, Pittsburgh Steelers, Roosevelt Nix, Sammie Coates, Steelers free agents, Steelers wide receivers, Todd Haley, Vance McDonald, Xavier Grimble. Bookmark the permalink.